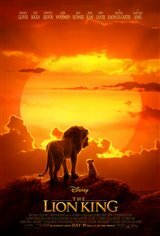 In this CGI and live-action version of the animated classic, Simba is a feisty lion cub who dreams of being king one day. However, his envious Uncle Scar (Chiwetel Ejiofor) has plans to ascend to the throne himself, and he forces Simba out of the kingdom. Alone and adrift, Simba (Donald Glover) soon joins the escapades of a hilarious meerkat named Timon (Billy Eichner) and his warmhearted warthog pal, Pumbaa (Seth Rogen). Adopting their carefree lifestyle of "Hakuna Matata," Simba ignores his real responsibilities until he realizes his destiny and returns to claim his place in the "Circle of Life." 'The Lion King' TV Spot - "Long Live the King"